Here you will find a list of cooking-related frequently asked questions regarding the blue crab. If you have a question, please send it to me and I'll research it and post the results here. Q: Most of the claws fell off during cooking! How can I prevent this from happening in the future? A: One of the crabs natural escape mechanisms allows it to "drop" a limb in order to avoid capture. This is known as autotomy (click here for more information.) Should a predator clamp down on a crab's claw—or any other limb—preventing its escape, the crab may "self-amputate" or sacrifice the limb so that it can free itself and swim to safety. When you pile a bunch of crabs into a pot and turn up the heat, the crab instinctively tries to escape. Dropping its claws is simply the crab's last futile attempt to run away. To avoid this (and be more humane), you can stun each crab by immersing it in ice-water for several minutes prior to cooking (this causes the crab to enter a dormant state, or "sleep.") Or, you can euthanize the crab immediately prior to cooking. 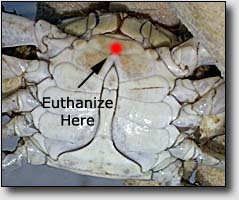 This is done by poking a sharp, pointed object (e.g., an ice pick) through the crab's "head" which kills it instantly (see photo at right). Hold the crab on its back and insert the pick through the shell just below the crab's mouth parts. Q: I have some live blue crabs and need to transport them a long distance (or store them alive). What's the best method to ensure they stay alive? A: Crabs can live for several days out of water as long as they are healthy and are kept cool, moist, and stress-free. The optimal temperature is about 50° F., anything colder will ultimately kill them. Alternatively, you can transport the crabs in a wooden bushel basket, covered with a damp burlap sack, and out of direct sunlight. While not optimal, this method is more practical for commercial watermen who utilize bushel baskets during the short period of time between catching and delivering their crabs to market. 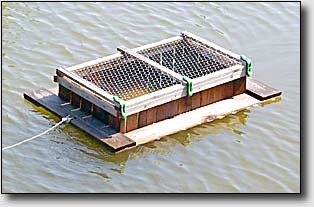 Storing Live - The best method for storing blue crabs involves the use of a live box placed in the water. A live box can be as elaborate as a specially designed wooden box or as simple as a 5-gallon bucket with large holes drilled throughout. It can be anything that keeps the crabs caged in the water. Crabs placed in a live box can easily live for several days, weeks, or longer, provided that you feed them. Note: Before preparing chilled crabs, allow them to warm to room temperature. Cold crabs will be in a dormant state and will be slow and lethargic, or may appear dead. Once they return to room temperature they should become feisty. Don't ever cook dead crabs! Note - I've heard many stories about crabbers who've found an "escapee" crab in their boat weeks after the crab was caught! The boat is always parked in a shady area and there is no standing water onboard. The crab probably kept is gills moist by hiding under a seat out of the sun, perhaps replenishing the moisture by utilizing the morning dew. What this proves is that a healthy, stress-free, crab can survive for many days (or weeks) out of water under the right circumstances. Crabs piled on top of each another in a bushel basket, unable to move, is not a stress-free environment! Q: I just cooked some crabs and they were hollow and full of water. I bought a new steamer and know they did not touch the beer/vinegar brine that I use... but where did all the water come from? They were definitely alive and didn't look bad when I bought them... when you cracked off the legs, water just poured out all over. My husband is telling me it was something I did wrong, but I know something was up with the crabs. Can you help? Q: What is the yellow stuff inside a cooked crab? Some people call it "mustard." Is it fat? A: Contrary to popular belief, the "mustard" (or the "green gland" or "tomalley") is not fat, it's actually the crab's hepatopancreas, a main component of the crab's digestive system. The hepatopancreas is a gland made up of very small branched tubes (ramified tubules) located on both sides of the mid-gut in the main body cavity directly under the top shell and functions as both liver and pancreas. It is involved in producing digestive enzymes and is responsible for filtering impurities from the crab's blood. The "mustard" has a strong taste and is eaten by many people who consider it a delicacy. Caution: Research shows that chemical contaminants such as polychlorinated biphenyls (PCBs), dioxin, mercury, and poison-inhalation hazards (PIHs) accumulate in the crab's fatty tissues and concentrate in the hepatopancreas. The contaminants, which are colorless, odorless and tasteless, and can increase one's chance of developing cancer, neurological impairments and miscarriage. Women of child-bearing age and children under the age of 5 are at particular risk. Crabs caught in advisory areas may contain high levels of these contaminants. If you catch crabs in these areas, it is highly recommended that you eat no more than six blue crabs per week and do not consume the "mustard" or cooking liquid. 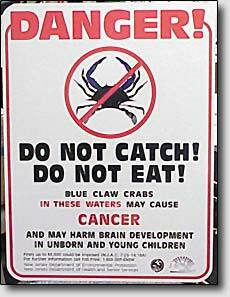 Eating, selling or harvesting blue crabs from the Newark Bay Complex (Newark Bay, Hackensack River, Passaic River, Arthur Kill and Kill Van Kull, and all tributaries to these waterbodies) is prohibited! In Maryland, blue crabs were sampled in several areas back in 1994-95, including the Chester, Bush and Gunpowder Rivers, Baltimore Harbor, Colgate Creek, Ft. Armistead, Old Road Bay, and Curtis Bay, and the Patapsco River. With the exception of the Middle and Northwest Branches of the Patapsco River, blue crabs were found to be generally low in contaminants. However, "generally low" is not the same as zero. When it comes to your health, it is strongly recommend that you avoid the "mustard". Q: Why does a crab's shell turn red-orange when cooked? A: The red pigment is the most stable component of the coloring in a crab shell. 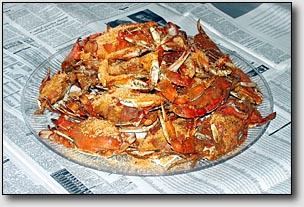 The greens, blues, and browns which darken the shell in a live crab are destroyed by cooking. The red pigment common to all shrimp, crab, and lobster shells is astaxanthin, a carotenoid (e.g., like Beta-carotene, the pigment that makes fruits red-orange). Astaxanthin was first identified in the exoskeletons of crayfish (Astacidea), hence its name. In crabs, as in many decapods, astaxanthin is not a free pigment, but is complexed with a protein called Alpha-crustacyanin, which alters the resonance of astaxanthin such that the complex acts as a blue-green pigment. As mentioned above, astaxanthin is heat stable, while the Alpha-crustacyanin protein is not, so boiling the crab shell denatures the blue-green Alpha-crustacyanin releasing the red-orange astaxanthin.